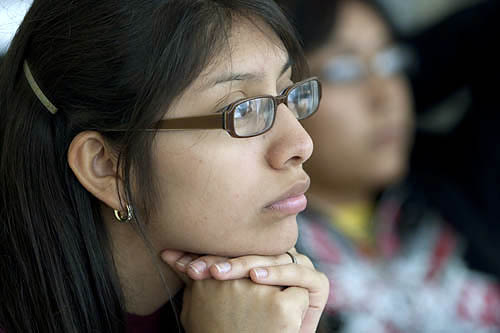 A Girl’s Life, a PBS documentary by researcher and author Rachel Simmons examining the challenges facing young women growing up in the 21st century, features Sonia Luna ’13 during her senior year at The Young Women’s Leadership School of East Harlem, N.Y. The story follows Luna as she applies to Bates and other colleges, striving to become the first in her family to attend college. Ultimately, Luna selects Bates because of a generous need-based financial-aid package, one that was made possible because she and Bates officials communicated effectively regarding her complex and changing residency status. Her story is the focus of Chapter 5, “Transitioning to Adulthood,” which begins 17:20 from the end. View or purchase the entire PBS documentary A Girl’s Life. Video courtesy of Powderhouse Productions.